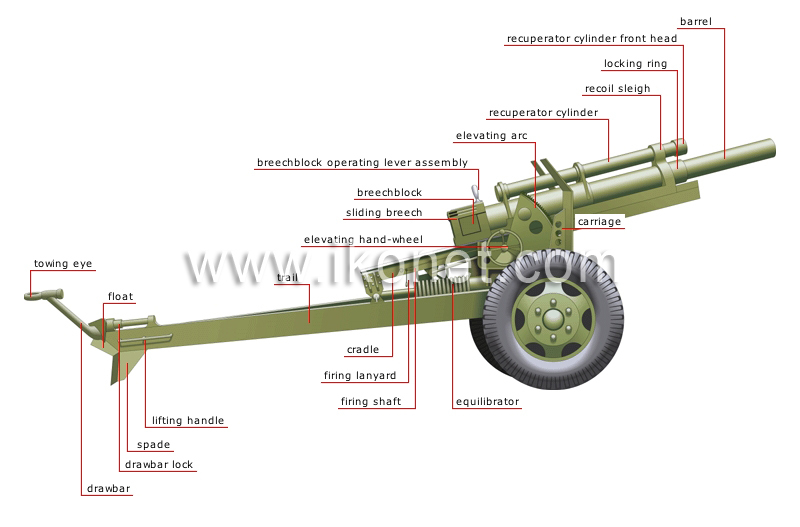 Direct-fire piece of artillery that launches a round of oval projectiles (shells); its size is between that of a cannon and a mortar. Metal plate that supports the trail during firing and prevents the spades from sinking too deeply into the ground. Cone-shaped double plate that is used to anchor the weapon to the ground in firing position. Handle used to lift the trail to move the howitzer. Support for the carriage; it is used to point the howitzer toward the target. Ring used to attach the howitzer to a towing vehicle. Metal rod that supports the towing eye; it is used to tow the howitzer and move the spades. Device that makes it possible to pivot and lock the drawbar. Piece that locks the barrel assembly and the recoil system. Mounting for the barrel that sits on top of the trail; its function is to aim and move the barrel. Wheel that controls the movement of the elevating arc. Hydraulic or spring-loaded system used to apply force to the cradle so that the barrel assembly and the recoil system are balanced on the carriage. Device that makes it possible to fire a projectile. Piece on which the barrel rests. Metal rod that transfers the thrust of the firing lanyard to the trigger when the howitzer is fired. Metal casing that houses the breechblock. Sliding part at the back of the howitzer that contains the firing mechanism. Lever that opens and closes the breechblock to load and unload the howitzer. Part that is removed to check and replace the recuperator cylinder’s hydraulic fluid. Double ring on the end of the cradle that allows the barrel to recoil when the charge explodes. Hydraulic cylinder used to bring the barrel back into firing position. Device with an arc-shaped cogwheel that is used to adjust the height of the shot.